So, you know what an iPhone is, and you know what an iPad is. But what exactly is this “iOS” thing, then? Not quite sure? Nope, iOS isn’t the name of another Apple gadget, nor is it an app in the App Store. Instead, iOS is the core software (or “operating system”) that powers three of Apple’s most popular portable gadgets: the iPhone, the iPad, and the iPod Touch. iOS on an iPhone or iPad fills essentially the same role as the Windows does on a PC, or as Mac OS X does on an iMac or a MacBook. …while the “i” in “iOS” stands for “Internet.” Why “Internet,” you ask? Interesting story. On an iPhone, for example, iOS is responsible for such behind-the-scenes grunt work as recognizing taps on the touchscreen, keeping track of the date and time, and sliding up the virtual keyboard whenever you compose an email or text message. It also juggles your phone calls, sounds alerts when you get text messages, and controls the built-in camera. On a wider scale, iOS is responsible for the overall look and feel of the iPhone/iPad/iPod Touch user interface, from the home screens and the app icons to the search bars and the menus. In addition to managing the core functions of an iPhone, iPad, or iPod Touch, iOS also serves as the foundation (or “platform”) for the hundreds of thousands of apps (such as Facebook, Netflix, Twitter, and even Candy Crush) in the Apple App Store. The same goes for Messages, FaceTime, Notes, Clock, and any other so-called “native” apps that comes with the iPhone, iPad, or iPod Touch. 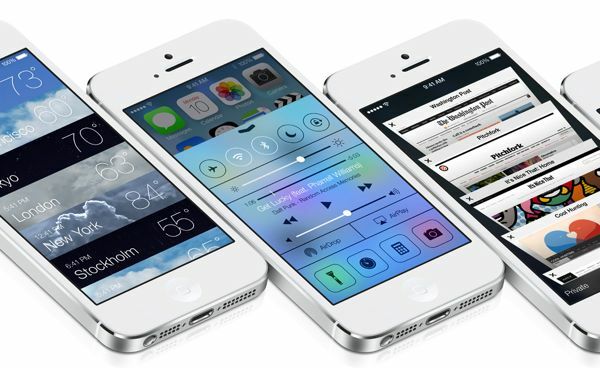 Apple comes out with a big new version of iOS about once a year, and the next version—iOS 7—is due this fall. Each version of iOS comes with a bevy of new features. For example, the ability to quickly switch between apps (“multitasking”) first arrived with the launch of iOS 4, while iOS 5 brought features like iCloud, Reminders, the swipe-down Notification Center, and Newsstand to the table. Last year, iOS 6 added FaceTime calling over cellular networks, a “do not disturb” mode, and Apple’s all-new (and much-maligned) Maps app. What’s on tap for iOS 7? For starters, there’s a new “Control Center” with quick-access controls for wireless, screen brightness, music playback, and other key settings. Also coming in the new update: a revamped Notification Center, photo filters for the built-in camera, wireless file transfers between nearby iPhones and iPads, and free (if ad-supported) streaming music through the new “iTunes Radio” feature. Last but not least, iOS 7 features a completely new interface—so new, in fact, that you may be a little startled (or even bewildered, depending on your point of view) the first time you see it. All the nifty new features in the latest iOS updates demand more and more from the actual iPhone, iPad, and iPod Touch hardware—and as time goes on, more and more older-model “iDevices” are getting left behind. iOS 7, for example, will only work on the iPhone 4, iPhone 4S, the iPhone 5—meaning the first iPhone, the iPhone 3G, and the iPhone 3GS will be left behind. Now, that’s not to say that your old iPhone 3GS will stop working once iOS 7 comes out; indeed, there are probably still plenty of original iPhones still chugging away. But older iPhones, iPads, and iPod Touches left behind by a new iOS update probably won’t see any more big software updates from Apple at all, save for the odd maintenance or security patch. Also, keep in mind that some of your favorite apps may eventually stop supporting an older iOS version. Update: Turns out that the App Store will be keeping older versions of apps for those with outdated iPhones and iPads, so no more worries on this front. Since your old iPhone, iPad, or iPod Touch will keep on ticking without the very latest version of iOS, there’s no pressing reason to rush out and update your device on Day One of a new iOS version. The answer is: you can’t, or at least not without jailbreaking your iPhone, iPad, or iPod Touch first—and if you do, Apple won’t help you if anything goes wrong in the process. That’s why you should look before you leap when it comes to new iOS updates—especially if you’re not a fan of change (and particularly given the radical, top-to-bottom interface revamp in iOS 7). …not “eye-ohs.” Good to know before bringing up the topic at cocktail parties. Still have questions about iOS? Post ’em in the comments below, or send me an email. iOS tip: I just got used to iOS 7. Do I need to upgrade to iOS 8?